The Tampa Bay Lightning have re-signed right wing Steve Downie to a two-year contract today, Vice President and General Manager Steve Yzerman announced. 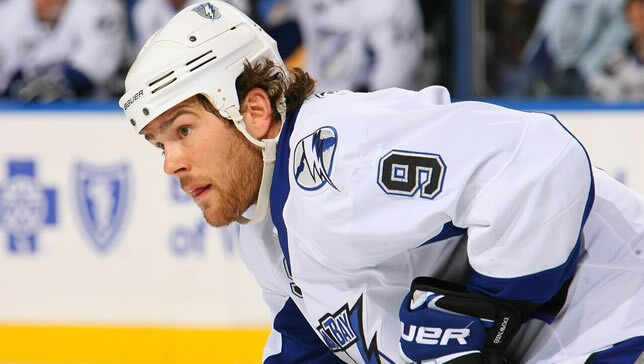 Downie, 5-foot-11, 200 pounds, played in 79 games with the Lightning last season, recording 22 goals and 46 points. He set career highs for games played, goals, assists, points and penalty minutes with 208. In the process he became the first player since Theo Fleury in 2001-02 to record at least 20 goals and 200 penalty minutes in a season. He ranked third in the league in penalty minutes and was tied for fourth in the NHL in shooting percentage with 19.0 percent. Downie led Tampa Bay in plus-minus rating and was second on the team in hits with 140. A native of Newmarket, Ontario, Downie has played in 140 career NHL games with Tampa Bay and the Philadelphia Flyers, registering 31 goals and 64 points. He has also appeared in six Stanley Cup Playoff games, all with the Flyers, recording an assist. Downie has also excelled in international competition, including the 2010 IIHF World Championships, where he recorded two goals in seven games while playing for Team Canada. He also helped Canada to gold at both the 2006 and 2007 World Junior Championships, combining for five goals and 12 points in 12 games. The 23-year-old played in 190 career junior games with Windsor, Peterborough and Kitchener. He amassed 82 career goals and 234 points. He also appeared in 43 OHL playoff games, recording 18 goals and 53 points. Downie was originally drafted by Philadelphia in the first round, 29th overall, in the 2005 NHL Entry Draft.